On first inspection, there's a dumpiness to Boerum Hill and its sister neighborhoods of Carrol Gardens and Cobble Hill (BoCoCa, since everything needs a shorter nickname nowadays). Nail salons and shuttered storefronts and graffiti seem to be common. And yet there's something upscale about the place that until you look for a little while longer, you don't see. Turn any corner off of the avenues and you walk down tree-lined brownstone streets. A new high-rise is being built. Is that a Halstead Properties office? How many bookstores does one neighborhood need? Oh my God, look at all these restaurants! And that's pretty much what did it for me. I may not have much in common with the shopping here, but the variety of food is great. If there's one thing that Brooklyn does better than all other outer boroughs combined, it's attract restaurants. And BoCoCa is no exception to that rule. And if there's one thing that Brooklyn does better than any other borough, it's outdoor seating. Street after street, the restaurants use their brownstone backyards as isolated, ivy lined little getaways from traditional urban dining. I heard a rumor the other day that FoHi (annoying, isn't it?) might see it's first rear patio dining area at Jade, which finally got approval to put seats outside. I guess we shall see. Frankly, I think the Gardens' Station Square should be exclusive to restaurants. 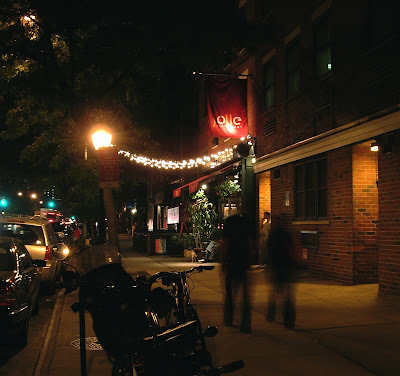 I met Bro after work here in Boerum Hill and we immediately proceeded to argue. I won't bother going into the details, but let's say our "debate" revolved around common courtesy, civilized society, and whether one should do something they were asked to do when the word please is attached to the request. The conversation continued down the street from the subway and around the corner of Atlantic to Jolie itself. It continued until we were seated and pretty much until the appetizers came. They came quickly. Don't worry, we don't belong to those annoying one of those annoying families that make a scene. 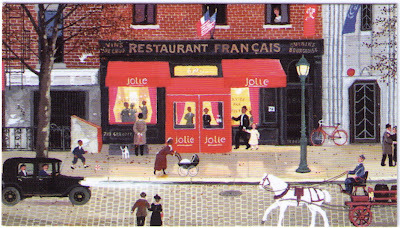 Jolie has two dining areas, one inside and one outside in the rear, and reminds me of what used to be my favorite restaurant, the long-gone, much lamented Plate 347 on Second Avenue. Walking in are tables all along the wall until you get to the outdoor patio area. Here we sat surrounded by trees and with the view of a church's stained glass windows. Tea lights line the brick walls and dim white bulbs like the kind you'd find on a Christmas tree are all that light the space. This would be a perfect date restaurant. The staff was very nice and like I said, the food came quickly and was cleared quickly. While you think about your order and wait for your food, there are french rolls to munch on served with butter or an olive pate, which Bro thought was excellent. There was always a guy with a pitcher coming to fill our water at the halfway mark. The manager (or owner) always had a big smile when he was wandering around. So absolutely no complaints about the people. All right. 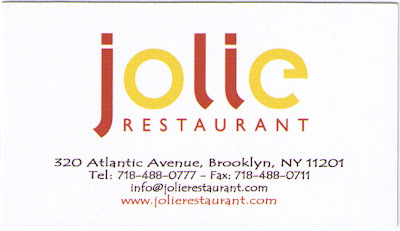 So the atmosphere at Jolie is second to none and the service was great. I wish the appetizers were as good. It's not that anything was bad. But there was a certain, um... blandness to them. As a starter I ordered the Escargots de Bourgogne au Beurre et Persille, which is a very long fancy way of saying traditional escargot, the kind served wallowing in butter and parsley. The escargot was perfectly cooked and melted in your mouth. The thing is, once it melted, there was nothing there. It was like the ghost of an escargot. There was simply too little flavor. And virtually the same can be said of Bro's Lobster Bisque. I, we, are used to bisques that are heavy and thick. This bisque was thin and loose. The lobster came through fine, but the texture was wrong and the brothy characteristic was disappointing. The only thing I can think if was that the chef accidentally grabbed the 1% milk instead of the cream when he reached into the fridge. Bro's entree was the Poulet Pallard, a hammered thin, peppery chicken breast served with an apricot sauce and side salad. The chicken was also a tad bland, and hence the sauce, which was very tangy and powerfully added the much-needed burst of flavor that carried this dish out of tastelessness. Zesty. I recommend the Poulet as a good summer dish and think it would have gone better if served with a crisp white wine or some French version of the margarita. My main course was Filet de Chevreuil, Sauce en Miel, Montard et Thym Frais, which was a mouth watering venison fillet served with mashed sweet potatoes and vegetables. This was delicious as evidenced by how I inhaled it. Bro had only finished half of his meal by the time I wolfed this down. I practically tore up some bread to wipe up all the sauce... but held back. In my defense, it was small. For dessert, Bro chose the Crepes Suzette. After all, who doesn't love a dessert that they cover in booze and light on fire in front of you? Pretty large. Very tangy. As for me, I chose the Chocolate Marquis. The best way to describe this gem is that you picture a brownie and cross it with a warm, creamy chocolate bar. Now drizzle chocolate syrup on one side and a vodka cranberry syrup on the other and top it off with a dollop of whipped cream. Ta-da. This has to have been one of the heaviest, most thoroughly rich chocolate desserts I've had since I don't know when. I did not get, but seriously considered Jolie's Trio of Creme Bruleé. I love creme bruleé and their trio of vanilla, nutella, and strawberry papaya sounded, at the very least, different. Maybe next time. The total bill for 2 appetizers, 2 entrees, 2 beers (Kronenbourg 1664), 2 desserts, and two 2 coffees, plus tax and tip, came to $110 and change. You could easily chop that cost down by ordering less expensive entrees than we did (but I really wanted that venison) and axing dessert. The bill comes with jelly beans.